December 11, 2011 by rwb, under Microcontroller. The Inter-Integrated Circuit or I2C (read as I square C) bus has been introduced in 1980 by Philips, and has become a de-facto world standard for data exchange between Microcontroller and various devices such as temperature sensor, ADC (analog to digital converter), DAC (digital to analog converter), I/O expander, EEPROM, and many more. With more than thousand different IC devices have been manufactured with an I2C-bus interface, making the understanding of the working principle of this I2C bus is an essential knowledge that has to be acquired by anyone who want to involve in the embedded world professionally or just as hobbyist. 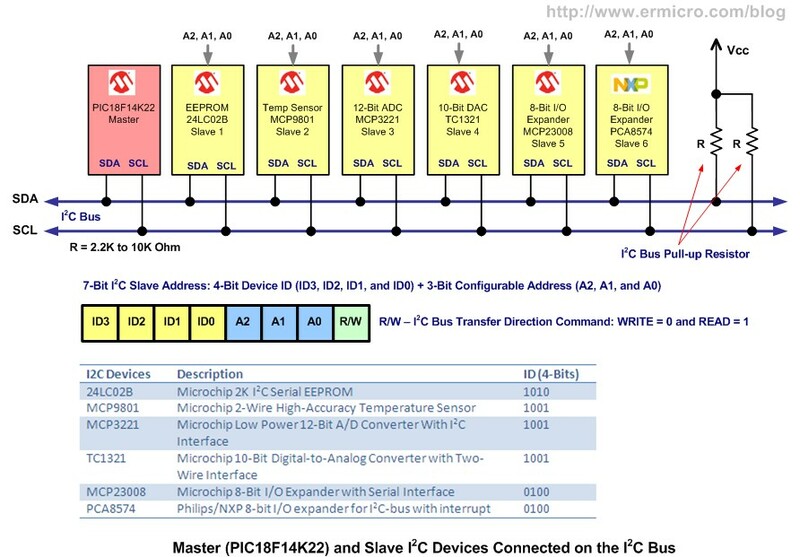 The I2C bus use master and slave communication principle which mean the slave will response to any master request and only one master or one slave could use the I2C bus at the time (half-duplex communication). Therefore the master and slave have to be connected known as “Wired OR” connection using the pull-up resistors for both the I2C serial data (SDA) and serial clock (SCL) as shown on this following picture. 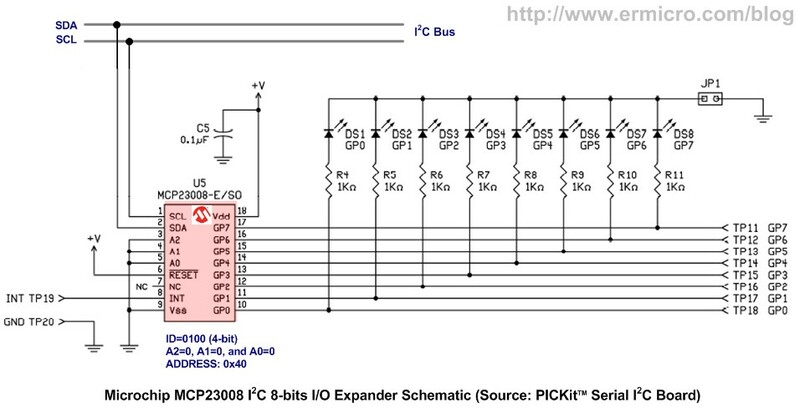 Unlike the SPI (Serial Peripheral Interface) slave devices, the I2C devices don’t have the chip select (CS) pin where the SPI master could simply drive the CS pin to logic “0” in order to communicate with the target SPI slave device, instead in I2C protocol the I2C master will transmit the I2C slave device unique address in order to communicate with it. When the I2C bus is idle both of the SDA and SCL line will be logic “1”. When the I2C master want to start communicate first it will send the START signal by putting the SDA line to logic “0” then it start to send the 7-bit I2C slave address followed by 1-bit I2C bus transfer direction command (WRITE logic “0” or READ logic “1”). The 7-bits I2C slave address consists of the upper 4-bits (ID3, ID2, ID1, and ID0) whose are the device specific ID (identification) and encoded within each of the I2C slave device. The next 3-bits address is called a configurable I2C slave device address as it depend on the address pins (A2, A1, and A0) on the I2C slave device logical input. For example if we connect the A2, A1, and A0 pins to the ground (GND) or logic “0”, then these 3-bits become “000” or if connect these pins to VCC, then these 3-bits become “111”. For example the complete I2C slave address for writing to the Microchip 24LC0B EEPROM whose configurable address A2, A1, and A0 pins connected to logic “0” is “10100000”. After the I2C master send the I2C slave address, then the I2C slave address will response by pulling the SDA line to low (logical “0”) and this is known as the acknowledge (ACK) to the I2C master. Next the I2C master will continue send the data or terminated the communication by changing the SDA line from logic “0” to logic “1” or known as the STOP signal to all the I2C slave devices and the I2C bus is back to the idle state status which both of SDA and SCL line is not being driven by both of I2C master and slave devices. In idle state the pull-up resistors will pull-up the SDA and SCL lines to become logic “1”. The I2C master read operation could be done by supplying the read transfer command (LSB) with logic “1”, for example the complete I2C slave address for reading from the Microchip 24LC02B EEPROM whose configurable address A2, A1, and A0 pins connected to logic “0” is “10100001”. Next the I2C master will send the not acknowledge (NACK) signal (logic “1”) to the I2C slave before sending the STOP signal, this NACK signal usually will tell the I2C slave device to stop transmitting any data to the I2C master. Sometimes before the I2C master read operation could be accomplish (indirect read), we have to do the I2C master write operation first which is used to set the I2C slave internal register, then we send the RESTART signal condition (i.e. STOP and START signal) followed by the I2C master read operation command. Additional SMD pull-up 10K (2) resistors for the PICKit Serial I2C Demo Board, you need to solder these two SMD resistors on the board. Microchip PICKit2 programmer (used in this project), you could also use the Microchip PICKit3 programmer. Reference Document: Microchip PIC18F14K22 datasheet, Microchip 24LC02B datasheet, Microchip MCP9801 datasheet, Microchip MCP3221 datasheet, Microchip TC1321 datasheet, Microchip MCP23008 datasheet, and Philips/NXP PCA8574 datasheet. *dval=decval[lodata >> 6];           // Convert lower data to decimal. // Function set: Set interface to be 4 bits long (only 1 cycle write). 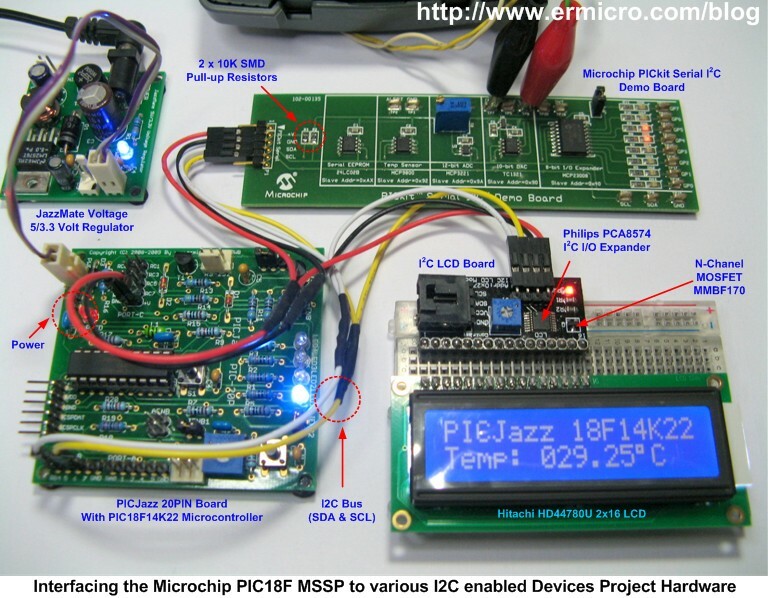 The Microchip PIC18F14K22 microcontroller I2C peripheral actually is the part of Master Synchronous Serial Port (MSSP) peripheral inside the PIC18F14K22 microcontroller. Each module could be operated in one of the two modes: Serial Peripheral Interface (SPI) or Inter-Integrated Circuit (I2C). The I2C module could support both I2C master and I2C slave modes. 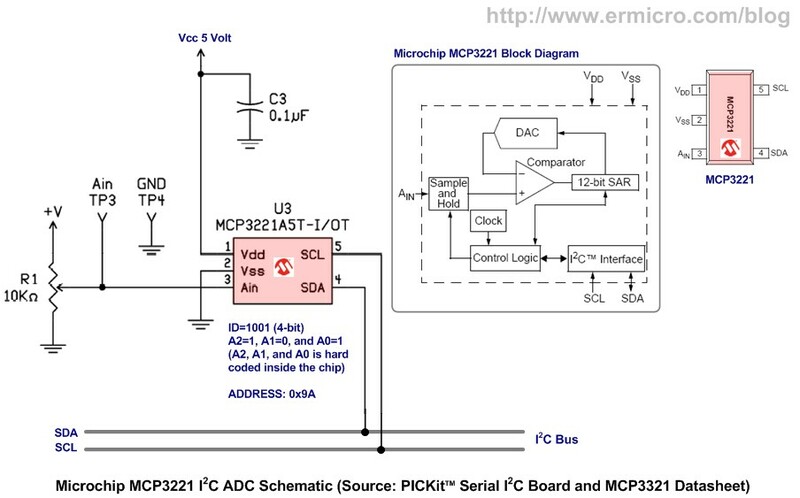 For the purpose of this tutorial we will only focusing on the I2C Master mode. To initialize the I2C peripheral inside the PIC18F14K22 microcontroller we need to enable the SDA and SLC pins for the I2C master operation using the Synchronous Serial Port Enable bit (SSPEN) and set the I2C master clock frequency using the MSSP Synchronous Serial Port Mode Select bits SSPM<3:0> in control register 1 (SSPCON1). Next we set the Baud Rate Register (SSPADD) so the I2C master will generate the required I2C frequency clock at 100 kHz. These following are the complete C code for initializing the PIC18F14K22 microcontroller MSSP in I2C master mode. 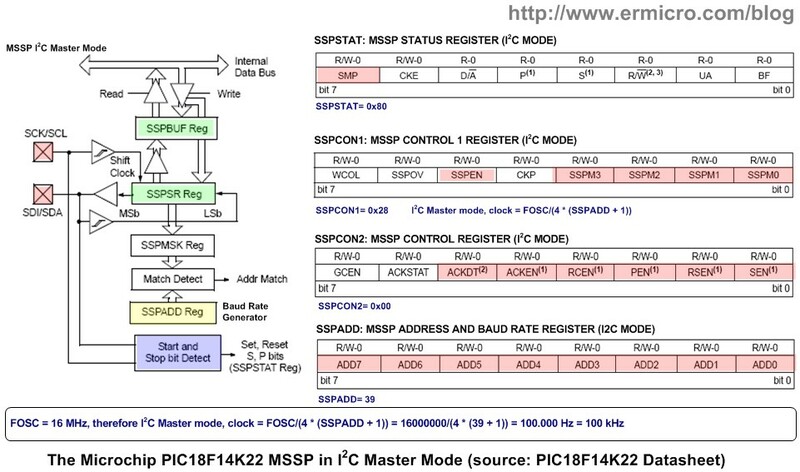 The Buffer Full bit (BF) in MSSP status register (SSPSTAT) is used to check the I2C master buffer. When the I2C master has shift all the 8-bit data through the MSSP shift register (SSPSR) then the BF bit will be cleared (logic “0”). Next we use ACKEN (Acknowledge Sequence Enable), RCEN (Receive Enable), PEN (Stop Condition Enable), RSEN (Repeated Start Condition), SEN (Start Condition Enable) bits in MSSP control register 2 (SSPCON2) , and read/write information bit (R/W) in SSPSTAT register to check the I2C bus idle condition. This I2C bus idle checker is implemented in i2c_idle() function. The I2C master START, STOP, and slave NACK signal are implemented in i2c_start(), i2c_stop(), and i2c_slave_ack() functions. 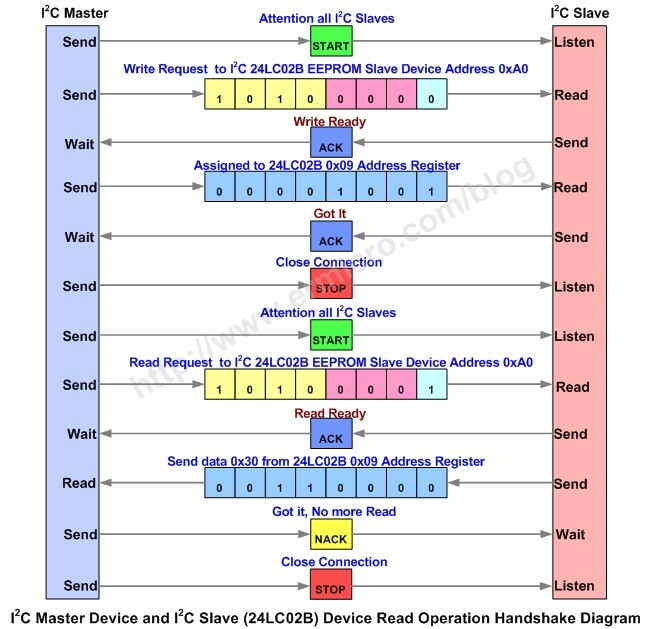 Now as you understand the principle of how the PIC18F14K22 microcontroler MSSP in I2C master work, next I used this following block diagram template to perform the PIC18F14K22 MSSP I2C master write and read operation to various I2C slave devices used in this project. 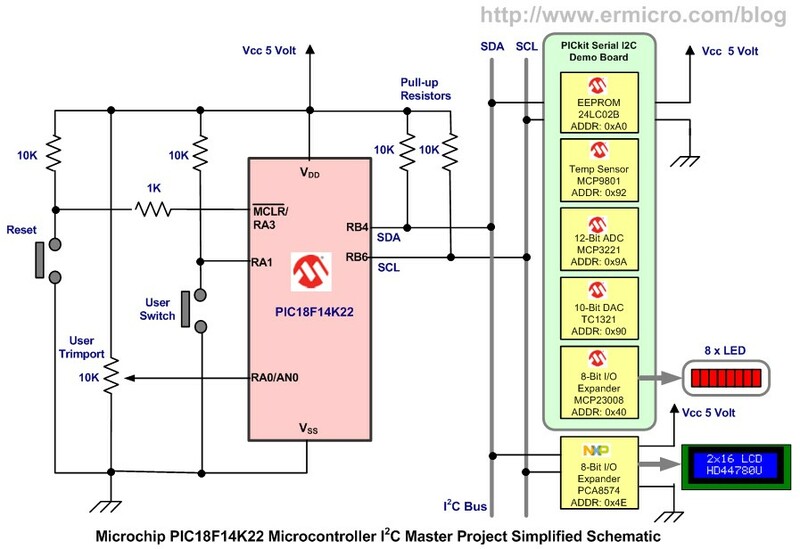 For the complete information about the MSSP in I2C mode please refers to the Microchip PIC18F14K22 microcontroller datasheet. 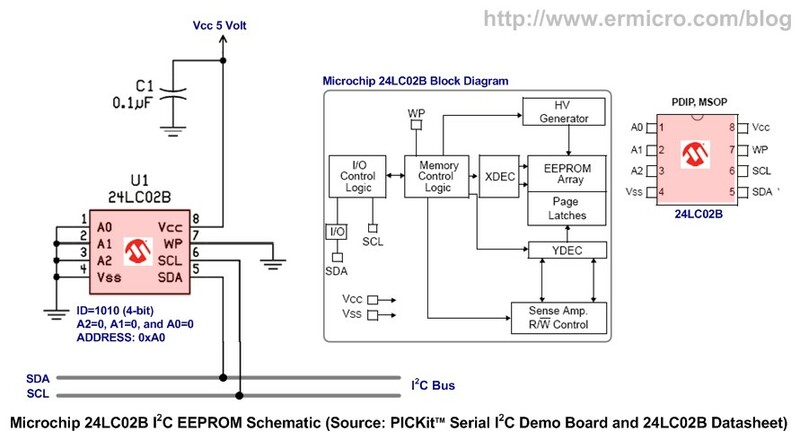 Because the Microchip 24LC02B I2C EEPROM only has 2Kbit (256 byte) memory, therefore we only need 8-bit address pointer to write or read data to or from the EEPROM. For the I2C EEPROM that has memory more than 256 byte such as Microchip 24AA128 EEPROM (128 Kbit) you have to use the 16-bit address pointer this mean first you need to send the upper 8-bits of the EEPROM address then next the lower 8-bits of the EEPROM address. In this project I used the 24LC02B I2C EEPROM to store the 8-bits LED data pattern and next retrieve the data to be displayed by the Microchip MCP23008 I2C 8-bits I/O expansion. The complete 24LC02B write and read (I2C indirect data read) operation is implemented in Write_24LC02B() and Read_24LC02B() functions. For more information on how to operate the Microchip 24LC02B please refers to the 24LC02B datasheet. The MCP9801 also capable to rise an alert on ALERT pin (pin 3 is an open collector), If the ambient temperature exceeds the limit preconfigured maximum temperature on the temperature limit-set register. The complete MCP9801 write and read operation is implemented in Write_MCP9801() and Read_MCP9801() functions. For more information on how to operate the Microchip MCP29801 please refers to the MCP29801 datasheet. The Microchip MCP3221 is a successive approximation A/D converter with 12-bit resolution, unlike the other I2C device, the MCP3221 doesn’t have the A2, A1, and A0 pins, instead this address is hard coded inside the chip (A2=1, A1=0, and A0=1). 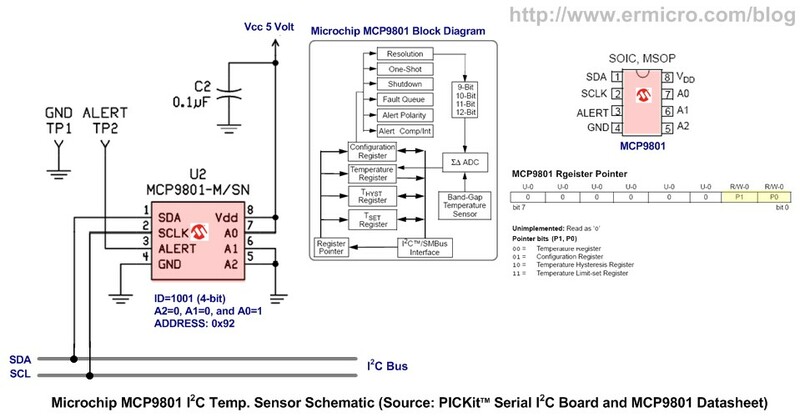 Therefore you could only connect one MCP3221 temperature sensor on the same I2C bus, according to the datasheet if you need different address setting you need to contact the Microchip Technology Inc.
Because the MCP3221 has 12-bits ADC output, therefore we need to read it twice. First the MCP3221 will send the upper 8-bits (high byte) data and next the lower 8-bits data (low bytes). I used the MCP3221 ADC reading to give a delay inside the infinite loop; this will give an adjustable speed of the LED chasing effect display (attached on MCP23008 8-bit I/O expansion) according to the ADC value returned by MCP3221. 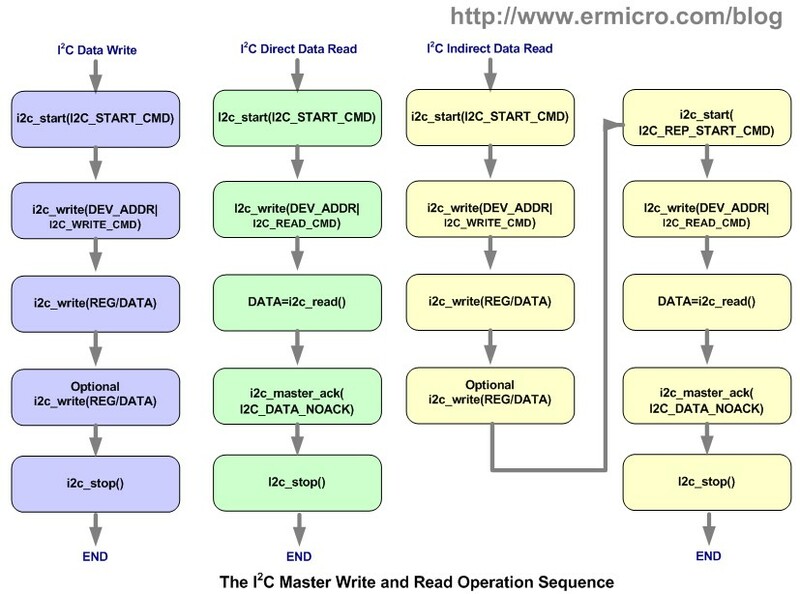 The complete MCP3221 read operation is implemented in Read_MCP3221() function. For more information on how to operate the Microchip MCP3221 please refers to the MCP3221 datasheet. 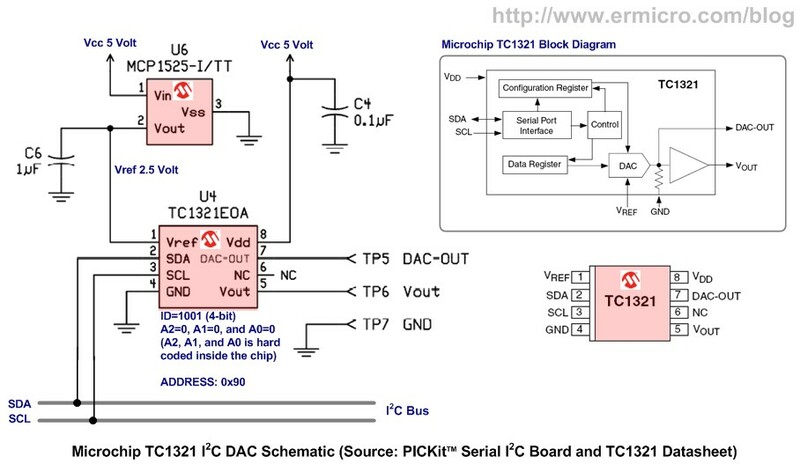 The Microchip TC1321 is a serially accessible 10-bits voltage output digital-to-analog converter (DAC). The DAC produces an output voltage that ranges from ground to an externally supplied reference voltage. The TC1321 is ideal to be used in the Programmable Voltage Sources and the Digital Controlled Amplifiers/Attenuators. The TC1321 also doesn’t have the A2, A1, and A0 pins, instead this address is hard coded inside the chip (A2=0, A1=0, and A0=0). Therefore you could only connect one TC1321 DAC on the same I2C bus. Therefore using the voltage reference of 2.5 volt, the DAC voltage output (Vout) will swing from 0 volt to maximum of 2.5 volt according to the 10-bits data input. In this project the 10-bits data input is provided by the PIC18F14K22 internal 10-bits ADC peripheral on channel 0 (AN0) which is connected to 10K user trimpot and the TC1321 DAC output voltage (Vout) is simply connected to the DVM (Digital Volt Meter). The complete TC1321 write operation is implemented in Write_TC1321() function. For more information on how to operate the Microchip TC1321 please refers to the TC1321 datasheet. The Microchip MCP23008 I2C 8-bits I/O Expander has the 3-bit configurable address (000 to 111) which provides up to 7 devices that could be attached simultaneously on the same I2C bus. This will give you a total of 56 ports. MCP23008 also come with 11 internal register to control its operation. Before we could use the MCP23008 I/O ports first we have to configure the I/O port as the output port or input port using the MCP23008 I/O direction register (IODIR). To write or read the MCP23008 I/O port we have to use the general purpose I/O register (GPIO). In this project I used all the MCP23008 I/O ports expander to display the LED pattern retrieved from the 24LC02B EEPROM. These following C codes show of how to initialize the MCP23008 I/O ports as an output ports. The complete MCP23008 write operation is implemented in Write_MCP23008() function. 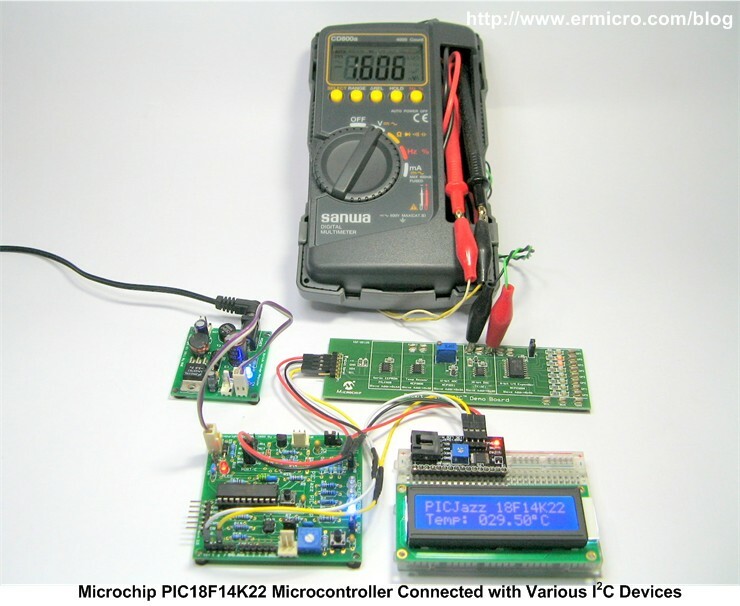 For more information on how to operate the Microchip MCP23008 please refers to the MCP23008 datasheet. Comparing to the Microchip MCP23008, the Philips PCA8574 is more simple to operate all you need is to directly write or read to or from the PCA857A I/O register ports. Similar to the MCP23008 I/O expander, the PCA8574 I/O expander has 3-bit configurable address (000 to 111) which provides up to 7 devices that could be attached simultaneously on the same I2C bus. 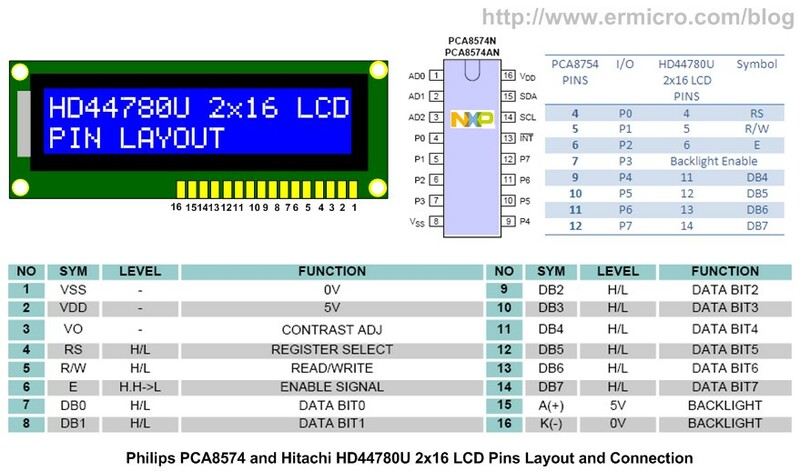 In this project the Philips PCA8574 8-bits I/O expander is used to control the Hitachi HD44780U (or its compatible) 2×16 LCD. The complete I2C 2×16 LCD schematic is shown on this following picture. In this project I used the 4-bit modes of Hitachi 44780U 2×16 LCD driver to send the data from the PCA8574 I/O expander. 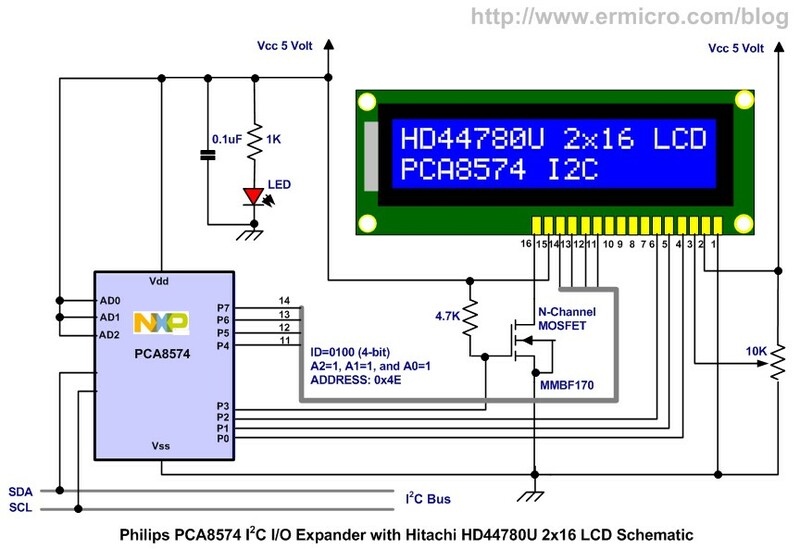 You could read the complete explanation of how to drive the Hitachi 44780U 2×16 LCD on this following article AVR LCD Thermometer Using ADC and PWM Project. The complete PCA8574 write operation is implemented in Write_PCA8574() function. For more information on how to operate the Philips PCA8574 please refers to the PCA8574 datasheet. After initializing the PIC18F14K22 ADC peripheral, the program continue initializing the PCA8574 I2C 2×16 LCD, Microchip 24LC02B 2KB I2C EEPROM, Microchip MCP23008 8-bit I2C I/O Expander, Microchip MCP9801 I2C Temperature Sensor, and Microchip TC1321 I2C DAC consecutively. Next the program enters the infinite loop and performs reading and writing to all of these I2C devices. Now you could watch and enjoy the entire project presented here on this following video, where you could watch how we use the Microchip PIC18F14K22 MSSP I2C master to control various I2C slave device simultaneously. The I2C nowadays is become a popular choice of the embedded system interface because of its main advantages of using 2 wire bus interface. On this tutorial you’ve learned to utilize the Microchip PIC18F14K22 microcontroller MSSP in I2C master mode to control various I2C devices simultaneously. Hopefully what you’ve learned here could extend your knowledge of how to use various I2C slave devices out there in your next embedded system project.